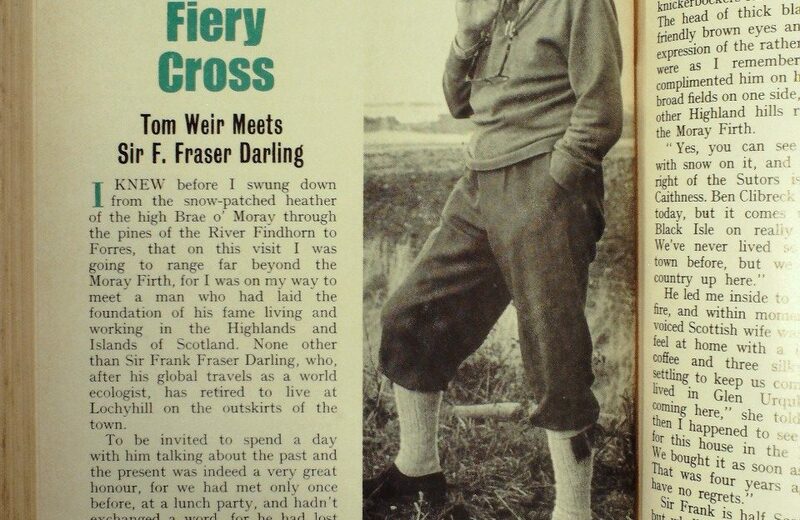 the great world ecologist, Sir F. Fraser Darling . . . I knew before I swung down from the snow-patched heather of the high Brae o’ Moray through the pines of the River Findhorn to Forres, that on this visit I was going to range far beyond the Moray Firth, for I was on my way to meet a man who had laid the foundation of his fame living and working in the Highlands and Islands of Scotland. None other than Sir Frank Fraser Darling, who, after his global travels as a world ecologist, has retired to live at Lochyhill on the outskirts of the town. To be invited to spend a day with him talking about the past and the present was indeed a very great honour, for we had met only once before, at a lunch party, and hadn’t exchanged a word, for he had lost his voice and couldn’t even manage a whisper. That was before he left Scotland and went to America, where he never failed to acknowledge his debt to the Scottish Highlands which had taught him to see and think about the landscape in a way that no one had done before. 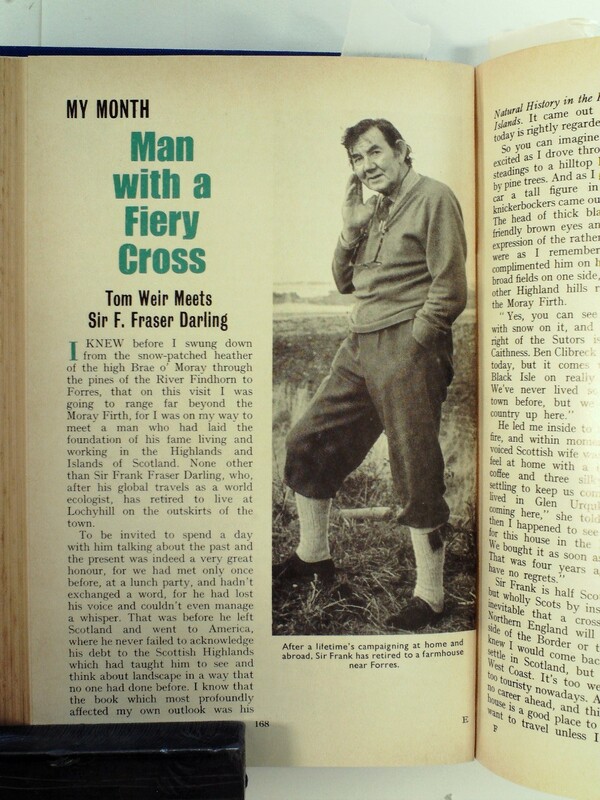 I know that the book which most profoundly affected my own outlook was his Natural History in the Highlands and Islands. It came out in 1947, and today is rightly regarded as a classic. So you can imagine I was fairly excited as I drove through the farm steadings to a hilltop house fringed by pine trees. And as I got out of the car a tall figure in jersey and knickerbockers came out to meet me. The head of thick black hair, the friendly brown eyes and the kindly expression of the rather sombre face were as I remembered them. I complimented him on his view, over broad fields on one side, while on the other Highland hills ranged above the Moray Firth. He led me inside to a blazing log fire, and within moments his soft-voiced Scottish wife was making me feel at home with a large cup of coffee and three silky Pekingese settling to keep us company. Sir Frank is half Scots by birth. but wholly Scots by instinct. 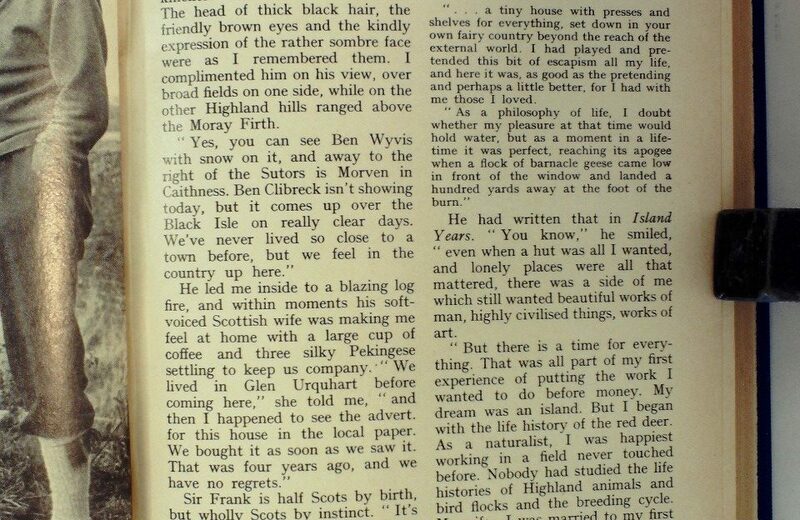 Looking around me at the elegant Chippendale furniture, the beautiful bird paintings on the walls and the fine, hand-carved objects on his bookcase, I could not help thinking of Eilean a’ Chleirich out west from Loch Broom, and the hut which was his first island home. pretending, and perhaps a. little better, for I had with me those I loved. a hundred yards away at the foot of the burn. He had written that in Island Years. “You know,” he smiled, “even when a hut was all I wanted, and lonely places were all that mattered, there was a side of me which still wanted beautiful works of man, highly civilised things, works of art. 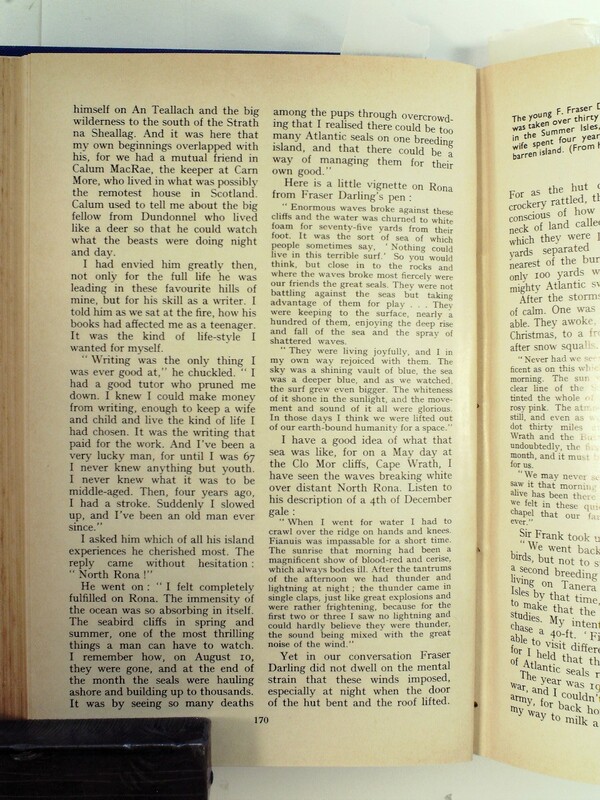 It was from Brae House, Dundonnel, that Fraser Darling launched himself on An Teallach and the big wilderness to the south of the Strath na Sheallag. 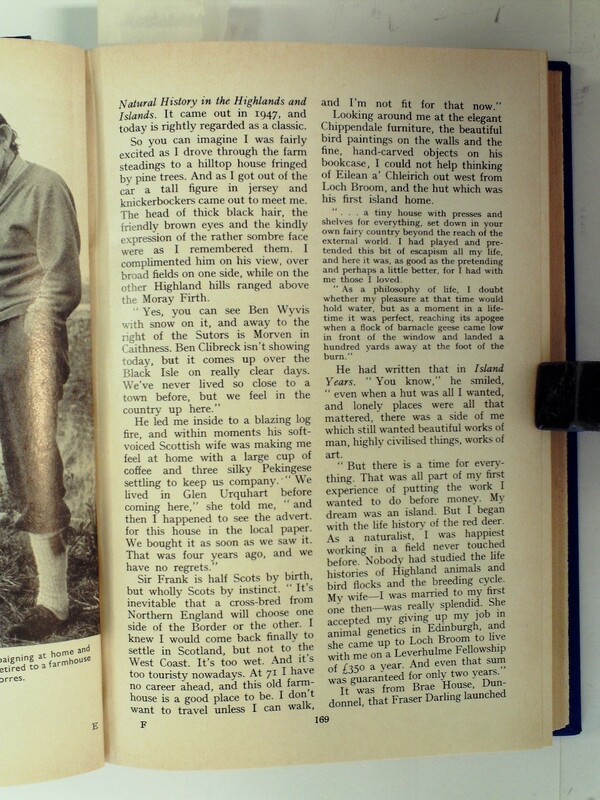 And it was here that my own beginnings overlapped with his, for we had a mutual friend in Calum MacRae, the keeper at Carn More, who lived in what was possibly the remotest house in Scotland. Calum used to tell me about the lug fellow from Dundonnel who lived like a deer so that he could watch what the beasts were doing night and day. 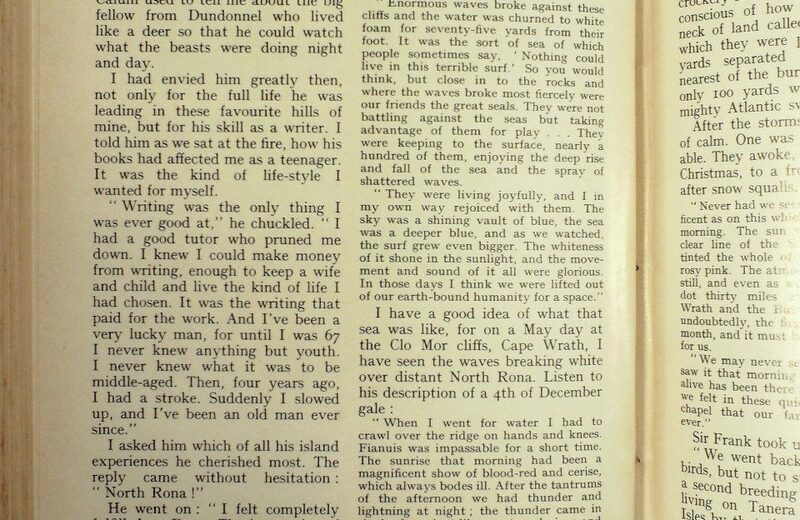 I had envied him greatly then, not only for the full life he was leading in these favourite hills of mine, but for his skill as a writer. I told him as we sat at the tire, how his books had affected me as a teenager. It was the kind of life-style I wanted for myself. rise and fall of the sea and the spray of shattered waves. They were living joyfully, and I in my own way rejoiced with them. days I think we were lifted out of our earth-bound humanity for a space. When I went for water I had to crawl over the ridge on hands and knees. been a magnificent show of blood-red and cerise, which always bodes ill. 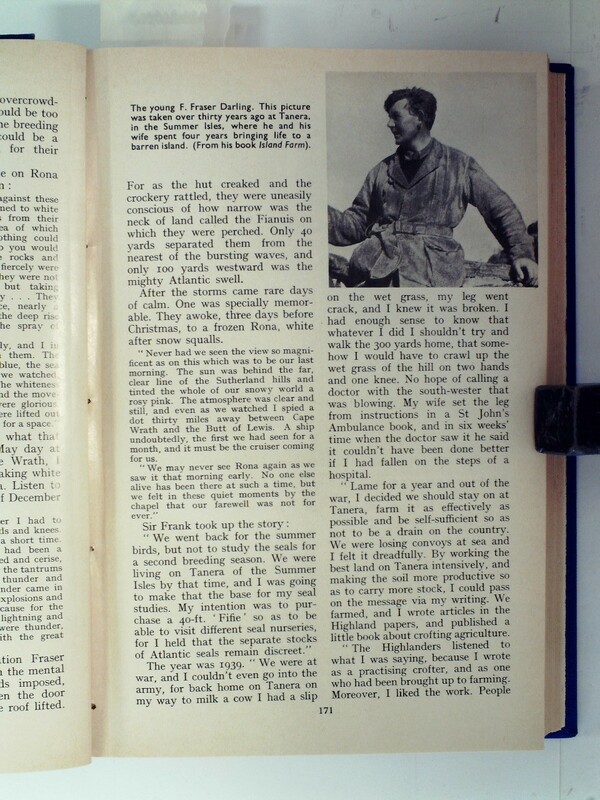 Yet in our conversation Fraser Darling did not dwell on the mental strain that these winds imposed, especially at night when the door of the hut bent and the roof lifted. For as the hut creaked and the crockery rattled, they were uneasily conscious of how narrow was the neck of land called the Fianuis on which they were perched. Only 40 yards separated them from the nearest of the bursting waves, and only two yards westward was the mighty Atlantic swell. After the storms came rare days of calm. One was especially memorable. They awoke, three clays before Christmas, to a frozen Rona, white after snow squalls. had seen for a month, and it must be the cruiser coming for us. We may never see Rona again as we saw it that morning early. No one else alive has been there at such a. time, but we felt in these quiet moments by the chapel that our farewell was not for ever. The year was 1939. 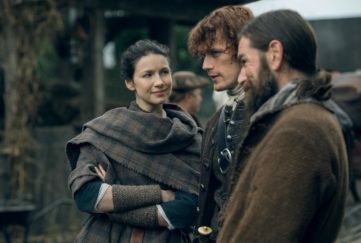 “We were at war, and I couldn’t even go into the army, for back home on Tanera on my way to milk a cow I had a slip on the wet grass, my leg went crack, and I knew it was broken. I had enough sense to know that whatever I did I shouldn’t try and walk the 300 yards home, that somehow I would have to crawl up the wet grass of the hill on two hands and one knee. No hope of calling a doctor with the south-wester that was blowing. My wife set the leg from instructions in a St John’s Ambulance book, and in six weeks’ time when the doctor saw it he said it couldn’t have been done better if l had fallen on the steps of a hospital. 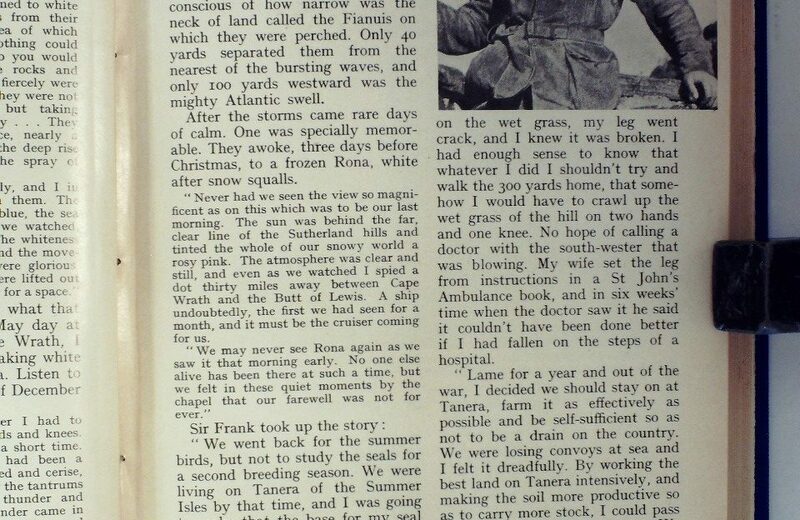 “Lame for a year and out of the war, l decided we should stay on at Tanera, farm it as effectively as possible and be sell-sufficient so as not to be a drain on the country. We were losing convoys at sea and I felt it dreadfully. By working the best land on Tanera intensively, and making the soil more productive so as to carry more stock, I could pass on the message via my writing. 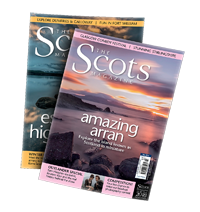 We farmed, and I wrote articles in the Highland papers, and published a little book about crofting agriculture. Island Farm tells the story of bringing life back to Tanera, and how the conviction was forced upon husband and wife that one family is too small a unit to live alone on a small island. 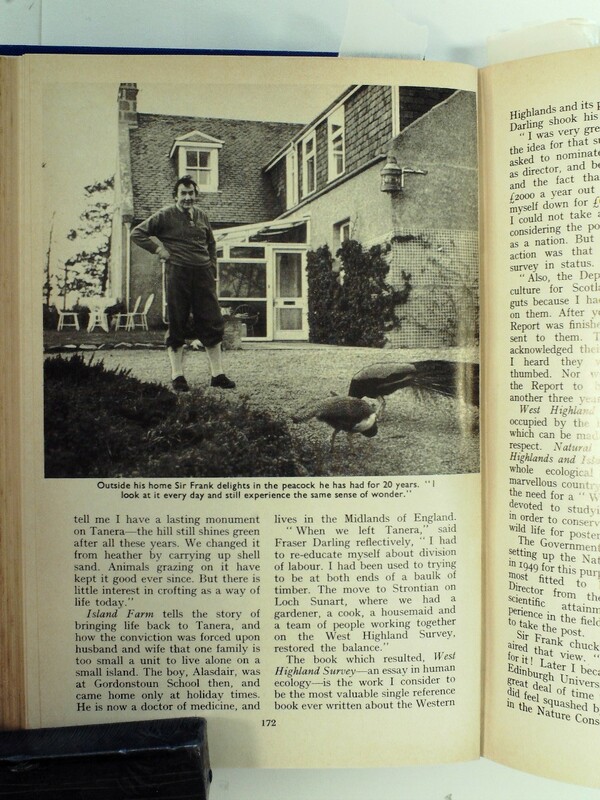 The boy, Alasdair, was at Gordonstoun School then, and came home only at holiday times. He is now a doctor of medicine, and lives in the Midlands of England. “I was very green when I put up the idea for that survey. 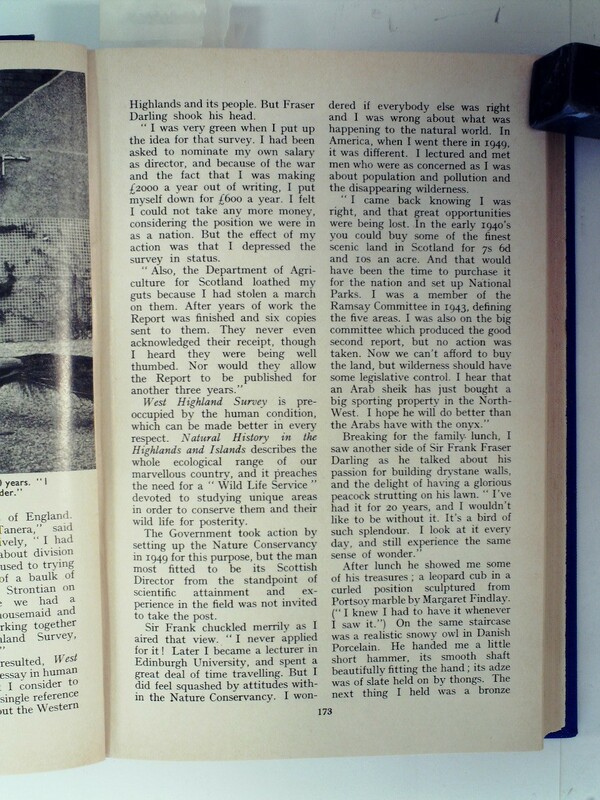 I had been asked to nominate my own salary as director, and because of the war and the fact that I was making £2000 a year out of writing, I put myself down for £600 a year. I felt I could not take any more money, considering the position we were in as a nation. But the effect of my action was that I depressed the survey in status. West Highland Survey is preoccupied by the human condition, which can be made better in every respect. Natural History in the Highlands and Islands describes the whole ecological range of our marvellous country, and it preaches the need for a “Wild Life Service” devoted to studying unique areas in order to conserve them and their wild life for posterity. 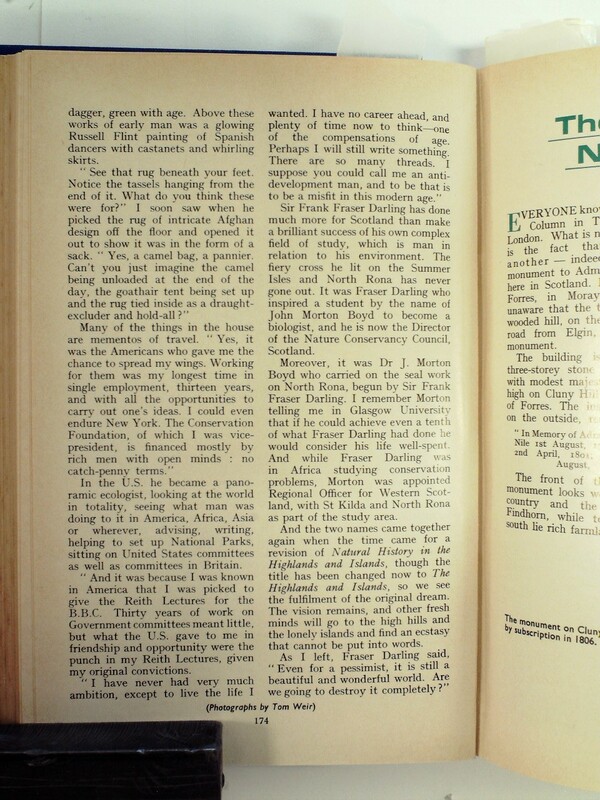 The Government took action by setting up the Nature Conservancy in I949 for this purpose, but the man most fitted to be its Scottish Director from the standpoint of scientific attainment and experience in the field was not invited to take the post. Sir Frank chuckled merrily as I aired that view. “I never applied for it! Later I became a lecturer in Edinburgh University, and spent a great deal of time travelling. But I did feel squashed by attitudes within the Nature Conservancy. I wondered if everybody else was right and I was wrong about what was happening to the natural world. In America, when I went there in 1949, it was different. I lectured and met men who were as concerned as I was about population and pollution and the disappearing wilderness. 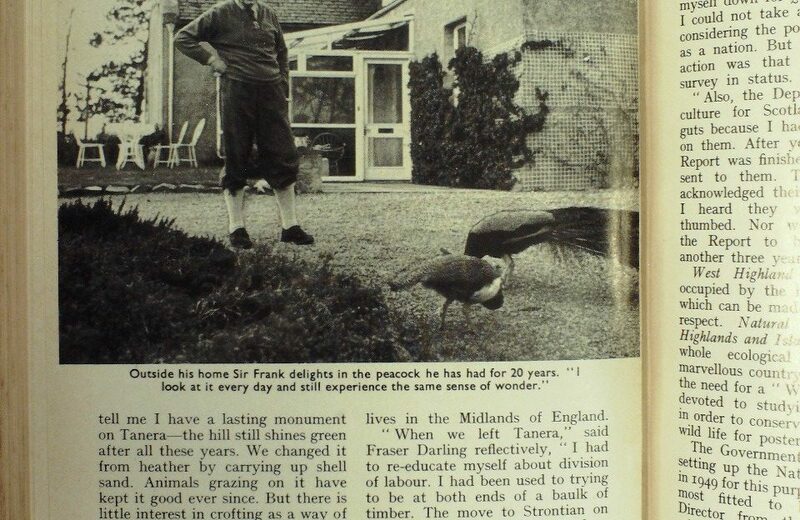 Breaking for the family lunch, I saw another side of Sir Frank Fraser Darling as he talked about his passion for building dry stane walls and the delight of having a glorious peacock strutting on his lawn. After lunch he showed me some of his treasures; a leopard cub in a curled position sculptured from Portsoy marble by Margaret Findlay. (“I knew l had to have it whenever I saw it”) On the same staircase was a realistic snowy owl in Danish Porcelain. He handed me a little short hammer, its smooth shaft beautifully fitting the hand; its adze was of slate held on by thongs. The next thing I held was a bronze dagger, green with age. Above these works of early man was a glowing Russell Flint painting of Spanish dancers with castanets and whirling skirts. I soon saw when he picked the rug of intricate Afghan design off the floor and opened it out to show it was in the form of a sack. Many of the things in the house are mementos of travel. In the U.S. he became a panoramic ecologist, looking at the world in totality, seeing what man was doing to it in America, Africa, Asia or wherever, advising, writing, helping to set up National Parks, sitting on United States committees as well as committees in Britain. “And it was because I was known in America that I was. picked to give the Reith Lectures for the B.B.C. Thirty years of work on Government committees meant little, but what the U.S. gave to me in friendship and opportunity were the punch in my Reith Lectures, given my original convictions. Sir Frank Fraser Darling has done much more for Scotland than make a brilliant success of his own complex field of study, which is man in relation to his environment. 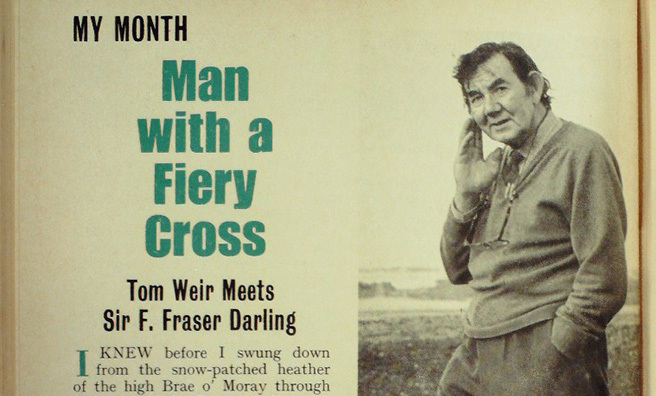 The fiery cross he lit on the Summer Isles and North Rona has never gone out. 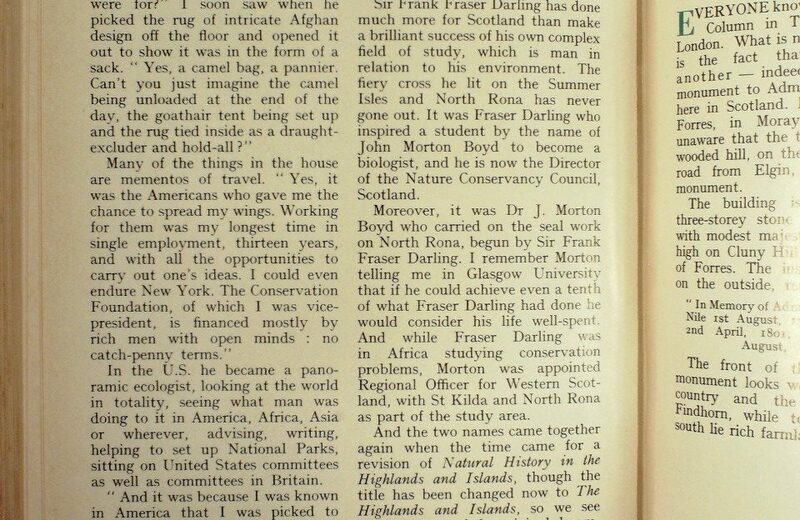 It was Fraser Darling who inspired a student by the name of John Morton Boyd to become a biologist, and he is now the Director of the Nature Conservancy Council, Scotland. Moreover, it was Dr Morton Boyd who carried on the seal work on North Rona, begun by Sir Frank Fraser Darling. 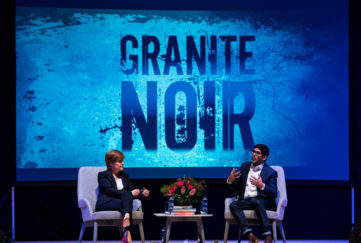 I remember Morton telling me in Glasgow University that if he could achieve even a tenth of what Fraser Darling had done he would consider his life well-spent. 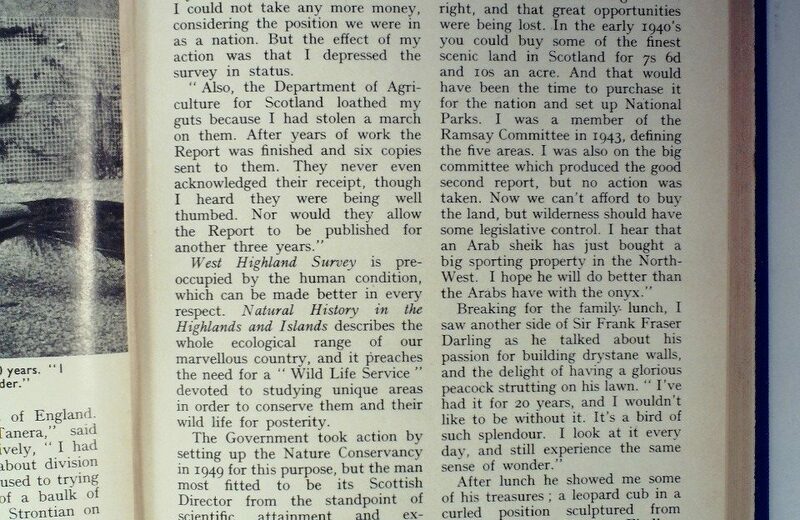 And while Fraser Darling was in Africa studying conservation problems, Morton was appointed Regional Officer for Western Scotland, with St Kilda and North Rona as part of the study area. 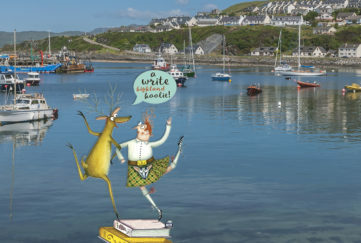 And the two names came together again when the time came for a revision of Natural history of the Highlands and Islands, though the title has been changed now to The Highlands and Islands, so we see the fulfilment of the original dream. The vision remains, and other fresh minds will go to the high hills and the lonely islands and find an ecstasy that cannot be put into words.